Cork consists of a tight web of up to 40 million cells per cubic centimeter. The cell membranes retain gas, giving cork its capacity to float, insulate and re-expand quickly after compression. Cork is natural, recyclable and biodegradable. No natural or man-made material replicates its properties. 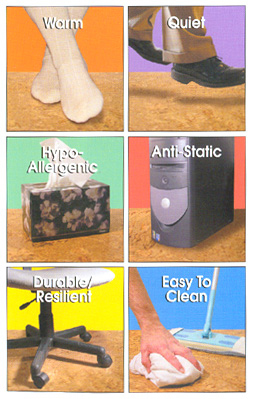 Cork retains unique qualities of flexibility, elasticity and compressibility. Its extreme resilience, impermeability, lightness and insulating efficiency make it ideal for a large number of flooring applications. Cork is hypoallergenic, mildew, moisture, dust, and pollen resistant. Cork is anti-static, it is recommended for use where computers and electronic equipment are used. Cork can be used anywhere in the house (below and above grade) because it is flexible, water-resistant, soft and warm.